BRAND NEW! YardCore! - a new reggae label will release these two dancehall tunes. Listen to Peppery aka Bongo Chilli and HiKee on the new 2Wings riddim produced by Syncro in GunJah studio. Big up the artists for these great tunes! @jah-billah: Thanks J-billah..respect to you! 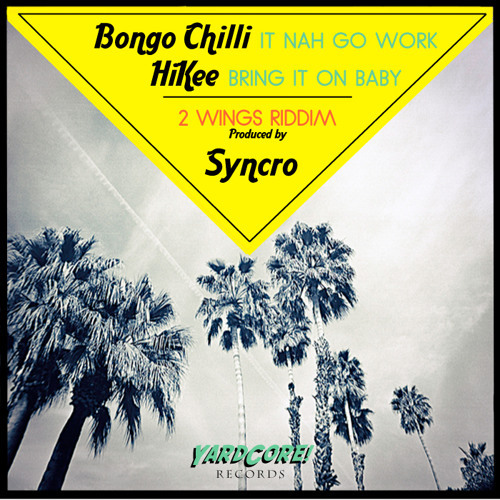 Buy YRC001 - HiKee - Bring it on baby (2WINGS RIDDIM) Produced by Syncro-OUT NOW! Users who like YRC001 - HiKee - Bring it on baby (2WINGS RIDDIM) Produced by Syncro-OUT NOW! Users who reposted YRC001 - HiKee - Bring it on baby (2WINGS RIDDIM) Produced by Syncro-OUT NOW! Playlists containing YRC001 - HiKee - Bring it on baby (2WINGS RIDDIM) Produced by Syncro-OUT NOW! More tracks like YRC001 - HiKee - Bring it on baby (2WINGS RIDDIM) Produced by Syncro-OUT NOW!